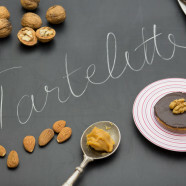 These Caramel Salted Butter Tartlets with Chocolate Ganache and this nutty flavor are a feast of gourmandise. 1 pinch salt Mix the flour, the ground almonds, the baking powder, the brown sugar, the vanilla sugar and a pinch of salt. One half of a beaten egg Add the soft butter and half of a beaten egg. Knead the dough into the hands until it becomes crumbly. Work it until the dough gets a homogenious ball. Keep it in the fridge at least 1 hour before use. The tartlet bottoms Remove the dough from refrigerator. 20g soft butter for greasing the molds (6.5 cm cm diameter, 1.2 cm height) Butter the small molds. a bit of flour for the workplan Sprinkle the working surface and the rolling pin with flour. Cut out pieces of dough to roll it step by step on a thickness of 2 mm. Cut discs from 6.5 cm (size of molds). Place them in the small molds carefully. Still they should stick well to the mold. Using a fork, prick the the tartlet dough. Keep the molds with the dough in the fridge during 1 hour before cooking. 180°C / 10 min Remove the molds from the fridge, and bake them for 10 minutes at temperature, until the edges become brown. 150 g caster sugar In a pan, heat the caster sugar over low heat, stir with a wooden spoon, let the sugar become brown, then caramelize it until obtaining a nice caramel color. 20 cl fresh cream (creme fresh liquid) While stirring, carefully pour the fesh cream to it. Pay attention the liquid may extrude! 75 g salted butter When the caramel is homogeneous, remove from heat, then add the salted butter. Chill. 90 ml fresh cream (creme fresh liquid) Put the chocolate and the fresh cream in double-boiler over medium heat. Let it melt while stirring. 20 g butter When the chocolate is melted, remove from the heat and add the butter until complete absorbtion. Rest in fridge / 30 min Let the tartlets chill in the fridge for 30 min so that the cream caramel hardens. The chocolate ganache Take the tartlet bottoms out of the fridge. Cover with chocolate ganache using a spatula, (1 mm thick). 1/2 walnut ( 1 / tartlet) Garnish with a half of a walnut. Rest in fridge / at least 30 min And again, let them chill at least 30 minutes in the fridge, so that the ganache cools down. Remove from the fridge 20 minutes before serving. When the tartlets are ready, it’s better to keep them on ambiant temperature to keep the crunchy of the bottom.